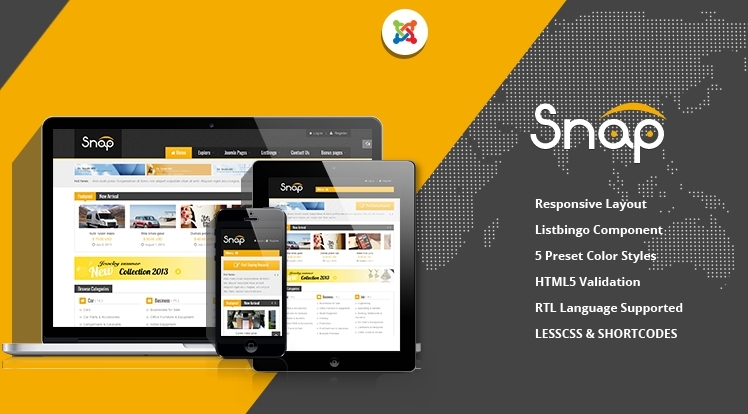 Sj Snap is a awesome responsive joomla templates for Joomla community, integrating Listbingo component which is a powerful classified site builder. Designed with responsive layout, 8 bonus pages and 5 preset color styles for various contexts, this template would be a multi-purpose template to help you show many types of classified and directory site. Thanks to YT Framework - a powerful responsive Joomla framework, this template is a totally responsive design as well as tons of configuration options included: colors scheme, menus, typography, google font... can be tweaked quickly to suit any need. Note: Listbingo is the 3rd Party component. To use this component in Joomla 3.x package, please buy HERE. (If you are SmartAddons member, you will be received 30% OFF for Listbingo. You can find the coupon code in our Partners Promotions page). Let's take SJ Snap tour, and you'll love it!